What would the world be without Spaghetti? Pimp them up and make a fun Easy Spaghetti Cupcake version! Spaghetti are the most famous Italian pasta and are super versatile. You can choose the most creative sauces to go with this amazing pasta or just go simple and delicious and toss them with plenty of fresh tomato sauce, basil, Extravirgin olive oil and Parmesan cheese. Go the extra mile and use any leftover spaghetti to make these irresistible cupcakes! 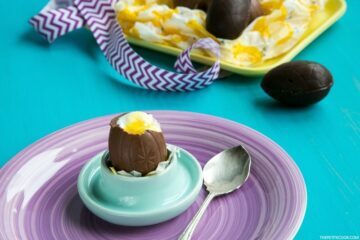 The recipe is really simple and altogether takes less than 30 min to make, from start to cupcakes, ehm, finish. However, as I said, the best way for making these awfully cute cupcakes is by using the spaghettata leftovers from the night before. It’s no secret that leftover spaghetti stir-fried the next day are even better than the fresh ones, they get crunchy and more flavorful. 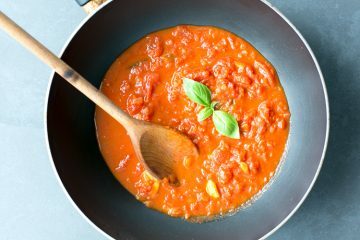 All you have to do is making a simple Italian tomato sauce. It takes about 20 min, the perfect time to set up the table, dropping the spaghetti into a pot of salted boiling water and open up a bottle of wine. By the time the sauce is ready, spaghetti will be cooked and prompt to be tossed into the pan with the sauce. As simple and delicious as it this, you can either have them straight away and leave the leftovers for making the cupcakes, or make directly your cute Spaghetti nests. 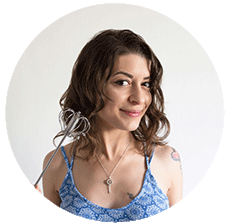 Turn the cupcake maker on ( or preheat the oven to 375F/190C), twist a small amount of spaghetti with the help of a fork, just the way you would do to eat them, and arrange on the cupcake tins. Bake for 5 mins until crisp, generously sprinkle some Parmesan shavings on top and serve immediately to your hungry guests. Tomato sauce works best for these yummy cupcakes, but I’ve also successfully tried them with my homemade pesto sauce, be creative and add your favorites vegetables, or proteins such as tuna, salmon, minced beef, your call! These spaghetti cupcakes will give a little twist to the usual version, they’re perfect for kids so they don’t mess around and I’m sure some grown-ups will thank me for this too. They’re also completely vegetarian and can easily become a regular meatless Monday recipe. 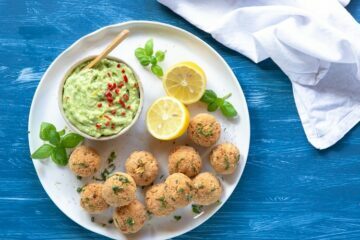 These savory cupcakes make a perfect bite-sized snack to serve at parties and impress your friends! Easy and fun Spaghetti Cupcakes are gonna be a hit at your next party! Heat a large frying pan over low temperature. Drizzle with oil and add onion and garlic. While the onion is cooking, remove the juices and seeds inside the tomatoes. Discard the garlic, and dd the tomatoes and the remaining juice into the pan and stir fry over high heat for about 2 min. Add half the basil and season with salt and pepper. Slightly cover with a lid and cook over low heat for about 20 min. Pour a little water through out cooking time if the sauce is getting too dry. In the meantime cook your spaghetti. Add them into a pot of salted boiling water and cook for about 10 min for al dente ( see package cooking time instructions). Drain the spaghetti and add them into the sauce pan. Add the remaining basil leaves and drizzle with a little olive oil. Stir fry for a minute to allow all the ingredients to mix together. 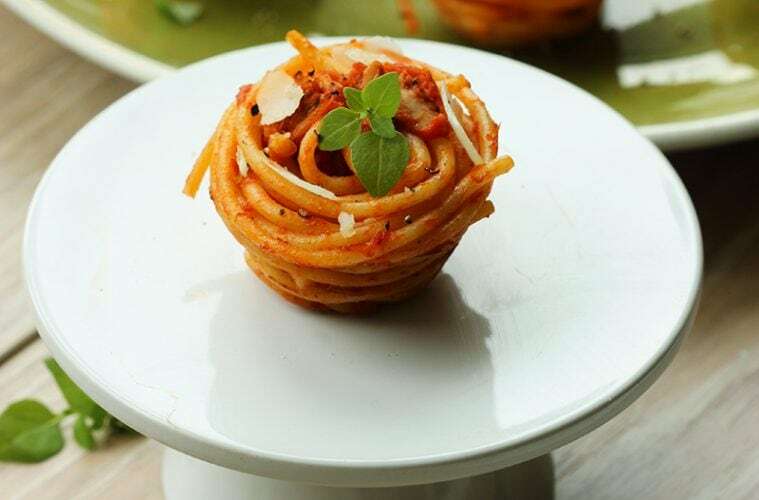 When the pasta is ready, form small cupcakes by rolling a little amount of spaghetti with a fork, just as you would do to eat them. Arrange the spaghetti nest into muffin tins and bake for 5 mins in a preheated oven to 360F/190C. Sprinkle with Parmesan shavings and freshly cracked black pepper. Decorate with extra basil leaves and serve. Enjoy!